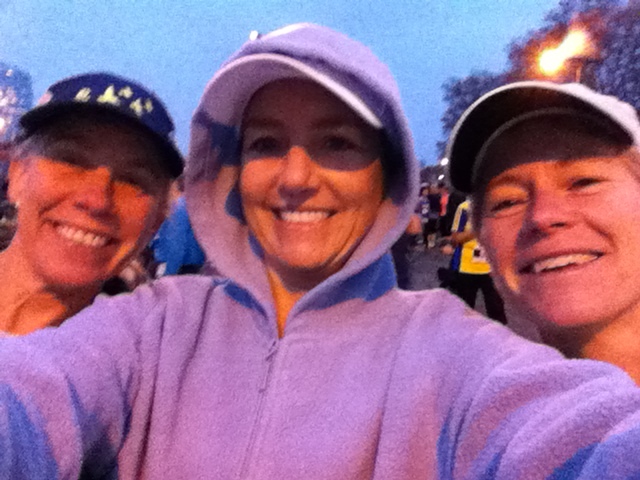 Here is a picture of Janet and Margaret as we walk to the start and evidence that we got to the right place:, and then a pic of us waiting – in the dark – before we loaded into our purple corral. And then we were off! We stayed together for about 1 mile, and then started to separate – it was too crowded to stay three across and it was just easier to go off at our own paces. Miles 1-13: great music, great fans, I probably got high-fived by 100 people, including little kids, who were yelling my name and telling me I was great. Who doesn’t love that? Mile 13:the half marathoners turned off here, and it was HARD to stay left to stick with the marathon – we could hear the cheering of the finish line and the announcer, but we went the other way to repeat the distance. Miles 14-20: once we went left and went past the half way, we were committed, and headed up the Schuylkill river for an out and back, with great fans waiting for us. And the good thing about an out and back, is that those ahead of you pass you on the return, which meant that as Margaret came by, she high fived me! Janet and I bumped into each other at the mile 17 water stop and stayed together for a little while, and then split again. Miles 26-26.2: the last .2 was the best because I was definitely out of gas, and then all of a sudden, my friend Julie yelled for me on my left, and then as I passed her, my daughter Ellie, a bunch of her friends, and Janet’s son, Conor, yelled from the right. 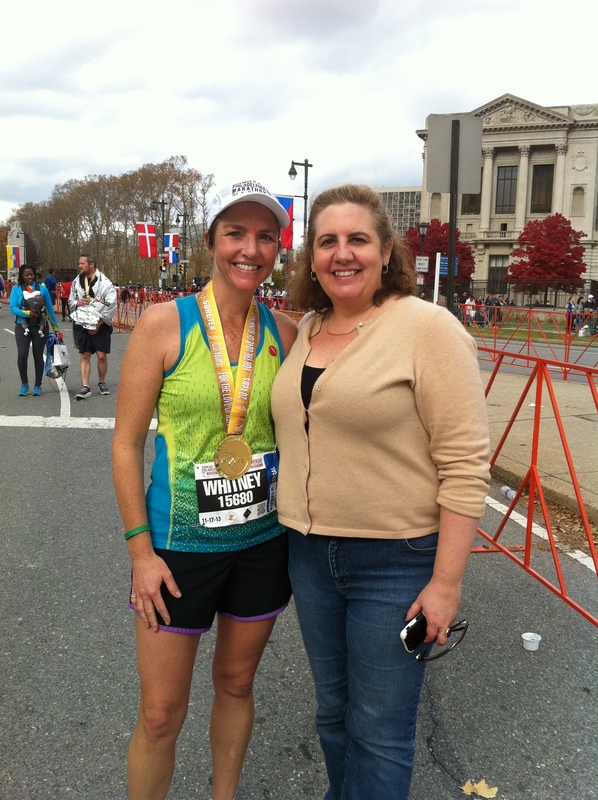 I was so cheered and excited that before I knew it, I crossed the finish line!!! Good luck, Roger – PS, I’m pregnant! There is a day you won’t be able to do this, but not today! 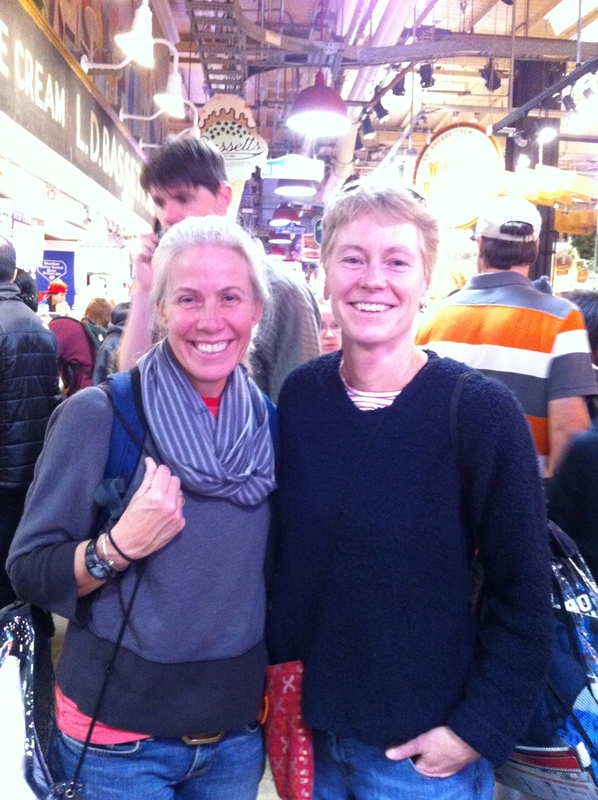 At the finish, Margaret and Janet and I found each other, and then we found our fan support! Thanks for reading through my journey with me! We’re here! I’ve been in Philadelphia for several days and I brought a really, really big bag. 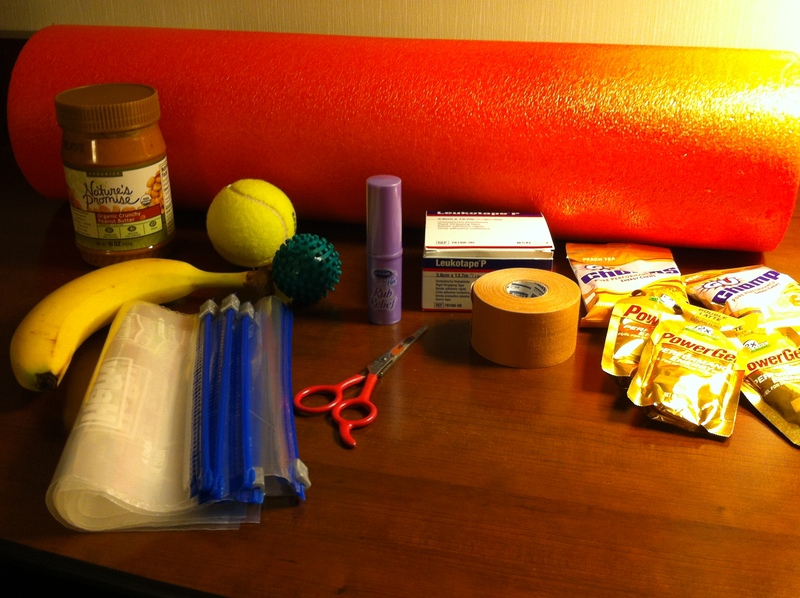 Mostly, the big bag is because I wanted to bring the foam roller, so then it was easy to just keep packing. So easy in fact, that Janet made me pack her stuff, too, so that all she had to deal with was a carry on bag the size of a lipstick tube. Athletic tape for any body parts that need to be taped up/on/in place. The weather report has been all over the place – from 60% to 10% to 30% to 10% chance of rain. We are now at no chance of rain – cloudy, temps between 55-65 degrees. Sounds pretty good to us! We also have a potential fan base coming … my daughter, Ellie, plus 4 of her friends, plus my BFF, Julie Twitmyer, plus Janet’s son, Conor. I’ve been here since Thursday for a work event. On Friday morning, our breakfast had a nice fruit plate, but it didn’t include bananas. I wanted to eat a banana every day this week to prepare for the marathon, so the lack of bananas was a problem. I politely asked the dining room person if I could have a banana, and he went and brought me one. SO nice. I’m hoping that the 30 other women traveling with me wanted bananas as much as I did and weren’t too sad about the lack of pineapple and blackberries. Janet and Margaret arrived this afternoon. Wahoo! Our hotel is right next door to the Expo where we went to pick up our bibs. 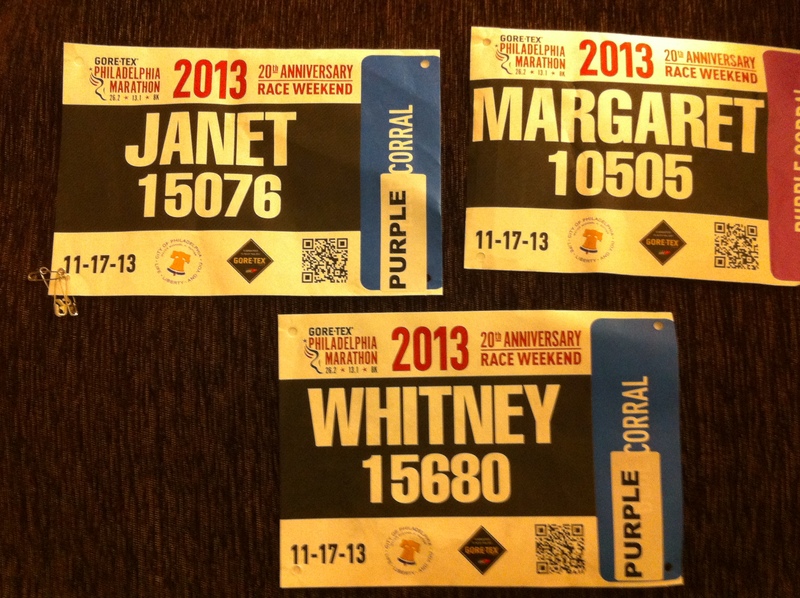 We picked up our numbers and Janet and I moved up two corrals. We are now in Blue Corral with Margaret. We have to be through security at 5 a.m. At the moment, we’re in a disagreement about when we need to get up and be out the door. 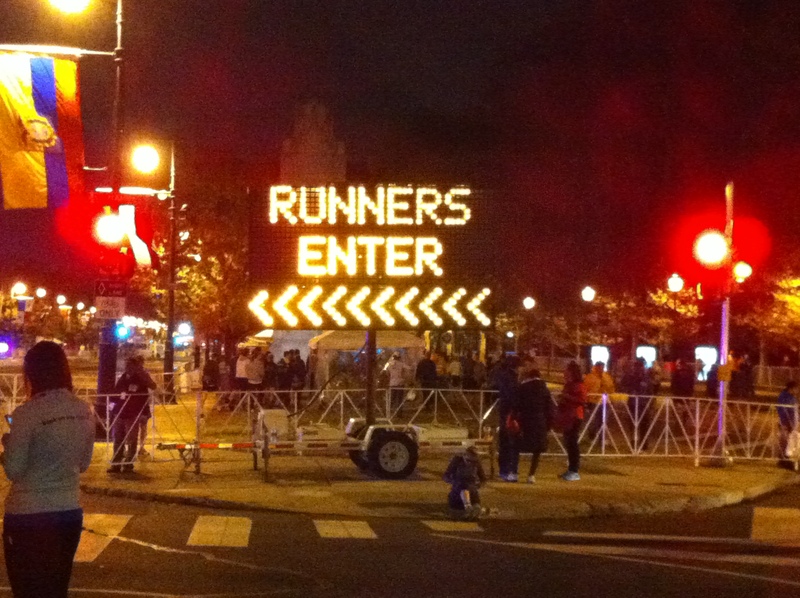 But, one way or another, we’ll get into our corral and cross the start line! Since I’ve been “accumulating fatigue” for the last 20 years, nevermind the last 18 weeks of training, I think I’m ready. 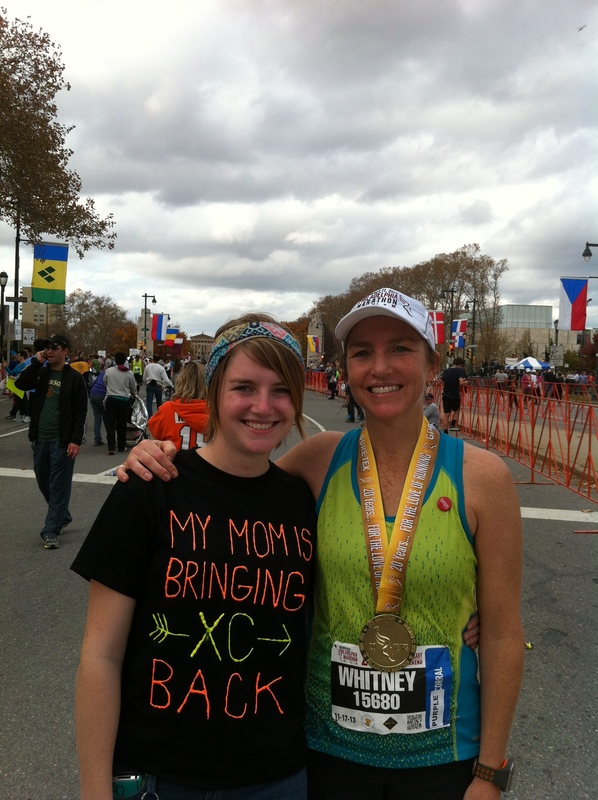 I posted this weekend that I was really anxious about getting through the marathon. Run your own race out there and believe in yourself and training. Smooth running ahead. Below is a photo of (L to R) Me, Joanie, Margaret and Janet. 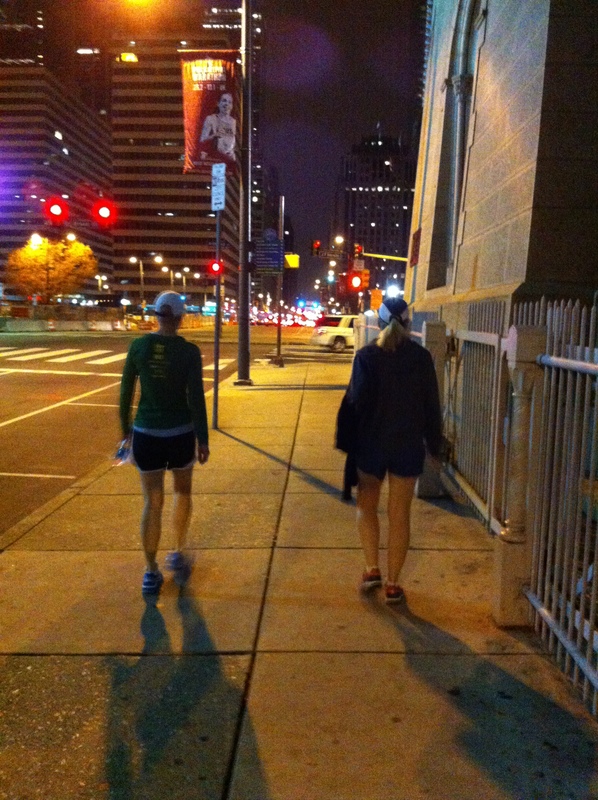 Joanie led us on a 6+ mile run as we began our marathon training in July. The countdown is really on. 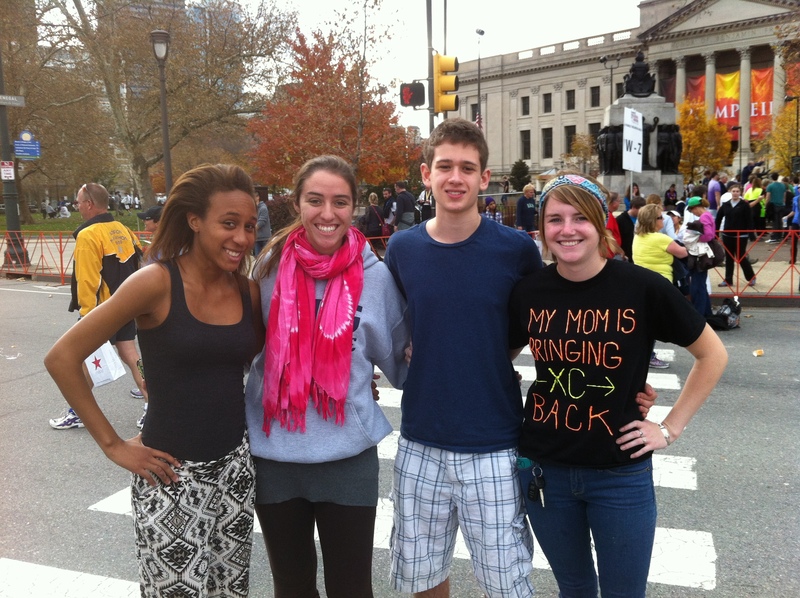 I got my official runner email from the Philadelphia Marathon! I’m number Bib Number 15680. Janet and I are in the LAST start corral (blue) because when we registered, we put in an estimated a generous finish time of 5 hrs. Margaret is in a faster corral (purple) because she estimated a really good finish time. 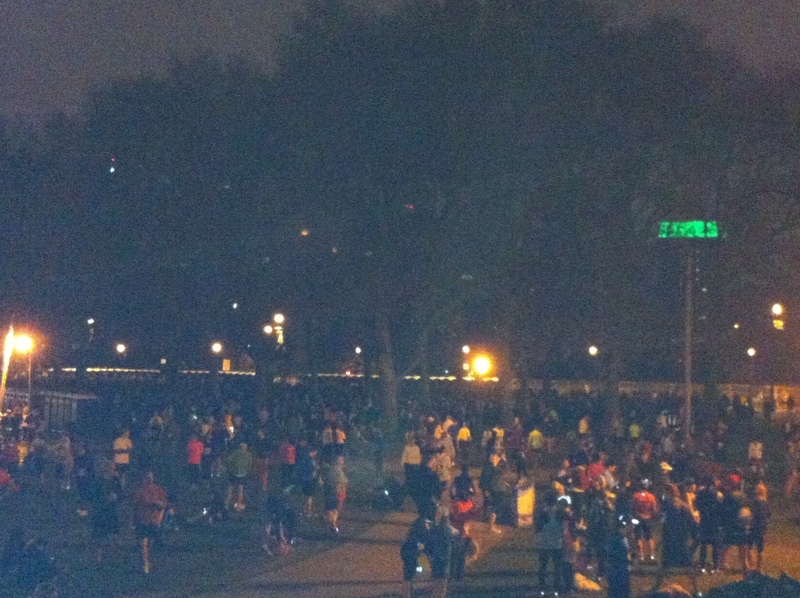 Our training runs are pointing to less than 5 hrs, so Janet and I may try to get into the next corral forward (orange.) 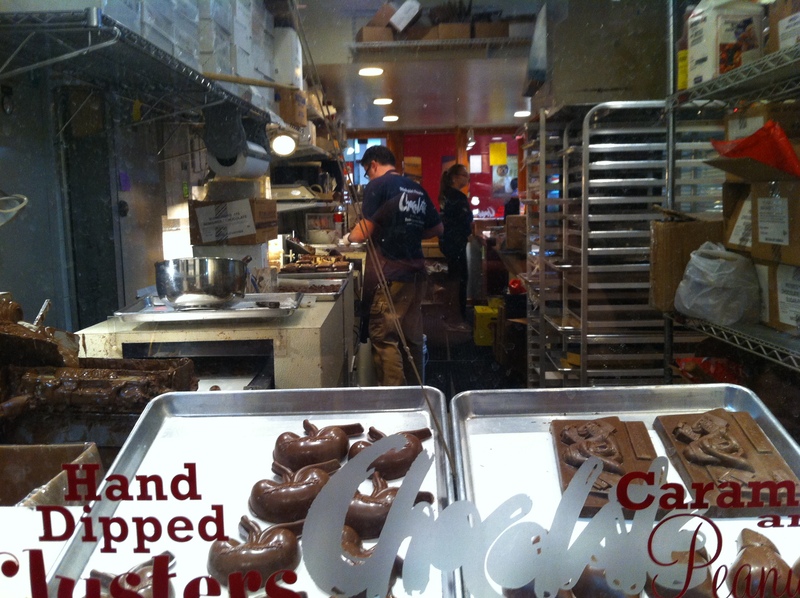 We’ll check that out when we pick up our bibs for real on Saturday. 17 weeks ago, I wrote a post called “Fear and Gear” – basically an introduction to the way my mind can take distance anxiety and translate it into hyperfocus on details that I feel I can control. Examples were worries about whether my gear would fit, not fit, rub, fall apart, fall off. Whatever. In time since that post, my fear has legitimately focused on cramps, shoving the long runs into an over-full life schedule, weather impediments, food, travel commitments, and… of course… the ongoing physical discomfort of running distance. However, as the runs have gotten longer, the focus has been on how to successfully complete the distance in front of me – and figuring it out. I chunked it up. I changed my diet. I changed my shoes. I did lots of awful physical therapy. I got it done. The longer the distances, the more I focused on real obstacles. Now, with 7 days left, I’m tapering. That means I don’t have that much time devoted to running, leaving my mind free to find fear. 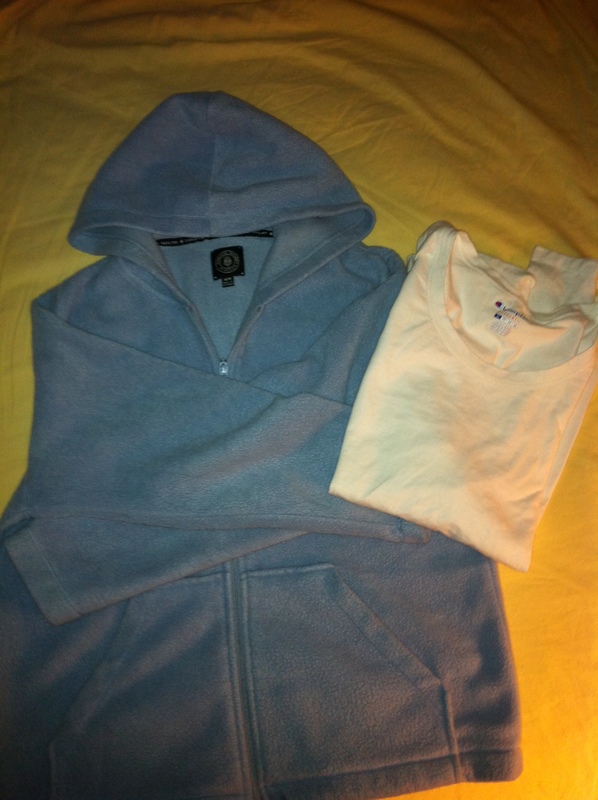 And whether I’ve got the right gear. I need to choose shoes. I have three different pairs. I have run hundreds of miles in the Hokas. So, I’ve been planning on using those for the marathon. But, last week, I thought, “WAIT. 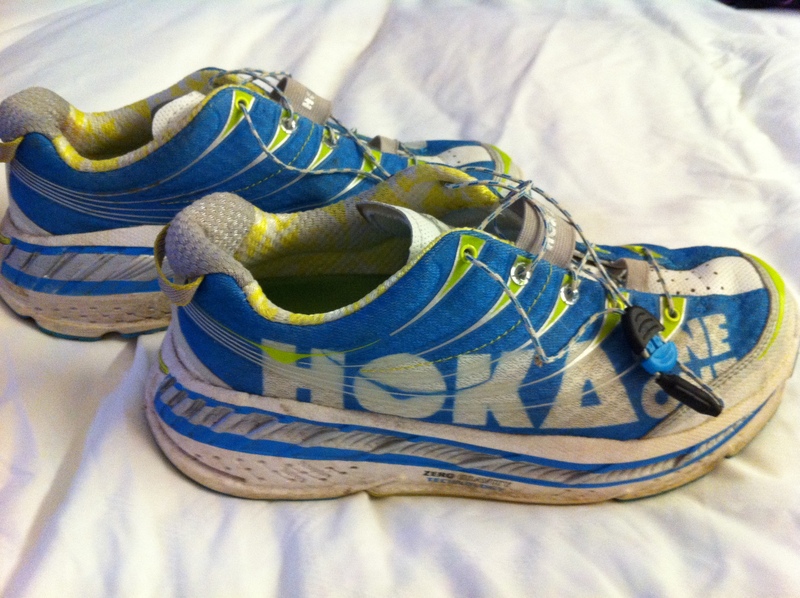 With over 400 miles on the Hokas, they probably need to be replaced. But is it bad to switch shoes with only 2 weeks to go? Probably not. But maybe I should. Should I? Probably not.” And then I bought new shoes. Below, you can see my well-worn Hokas Stinsons on the left. 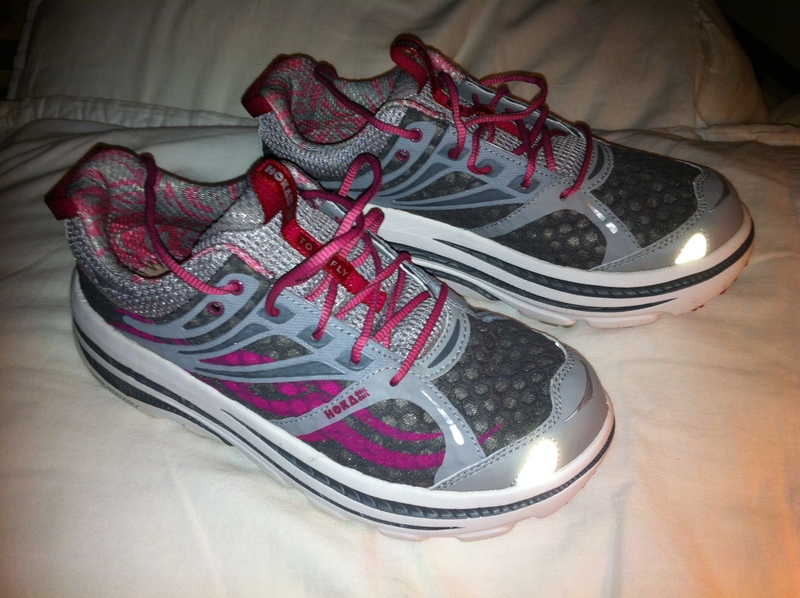 Then, you can see my NEW Hoka Bondis on the right. Interestingly, the new ones don’t look quite as ri-dunk-u-lous as my worn ones. (Sales must have been tough given the Muppet look, and the designers are clearly building a more traditional looking shoe.) It seemed like I could safely make the switch since the sales rep reported all the same support benefits of the Muppet version. NOT so. I ran 7 miles in the new Hokas and my right foot ached so much, it woke me up during the night. No problem, I’ll marathon in my Muppets. Except, now I worry that I really strained my right foot and no shoe will help me on race day. But, I can’t buy new Muppet Hokas because the running store doesn’t have them in stock. So, I’ll be running on old Hokas. I’d like to run in shorts. I don’t like running tights – no matter the brand, cut, size, squish, it always feels like they are falling down when I run. I hate the tights, but I love my shorts. In Maine, morning runs are now in 22- 38 degrees, and that would NOT be awesome in shorts for 26.2 miles on race day. But, the race is not in Maine, it’s in Pennsylvania, so I’m counting on a moderate mid-Atlantic temp, somewhere between 45-55 degrees. PLEASE be that warm, so that I can wear my shorts. My favorite shorts are by New Balance, shown below. They have shorts within the shorts, a flat waist band, and an ID zip pocket in the back (as seen in photo of back of shorts.) I love these shorts. I have 3 pairs of them. I also am now afraid of my Hot Spot cramp. This is different than my side-stitch cramp. The Hot Spot is on my right side, low, the size of a quarter, and when it hurts, it hurts all the time, especially if I’m pounding on the roads. If that happens, I get a compensatory cramp that will stop me. I think this is gluten related. I haven’t eaten gluten for the better part of a year (except I probably ate it in China, which probably contributed to my problems there) but, without thinking, I ate the MOST delicious dessert last night a work banquet. It’s called the Bowdoin Log. It’s ice cream rolled in crushed chocolate cookie smothered in fudge sauce. I licked the plate. THEN I remembered that the cookie crumbs would have gluten in them and, sure enough, a couple of hours later, my Hot Spot said hello. I am hoping that my body deals with this gluten invader quickly and forgets about it before next Sunday. And then, Janet, is pretty much out to sabotage me. In the course of 48 hrs, she sent me a screen shot of the Weather Channel’s 10 day forecast, showing 60% chance of rain on race day. I called her and said not nice things. Then, yesterday morning, we met up for our 8 miler run and since I didn’t have my Garmin to check my pacing, she led at blistering speed. We finished the 8 miles pretty fast, and that was a victory, but I was nauseous for the next 6 hours. This week, I only have about 12 more miles to run in total, then 2 days of no running, then Sunday is race day. I’ll post again with pre-race preparations. So, I was in NYC for work this weekend and my hotel, and every other hotel, eating establishment, subway train, and crosswalk was full of marathoners – many of them speaking languages other than English. Very cool! 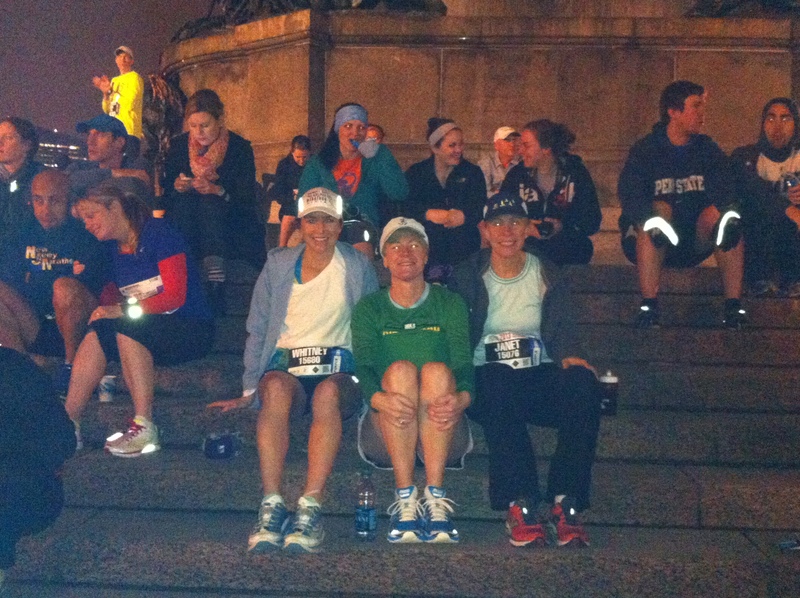 And it made NYC look like a city full of *exceptionally* fit individuals if you didn’t know the marathon was happening. 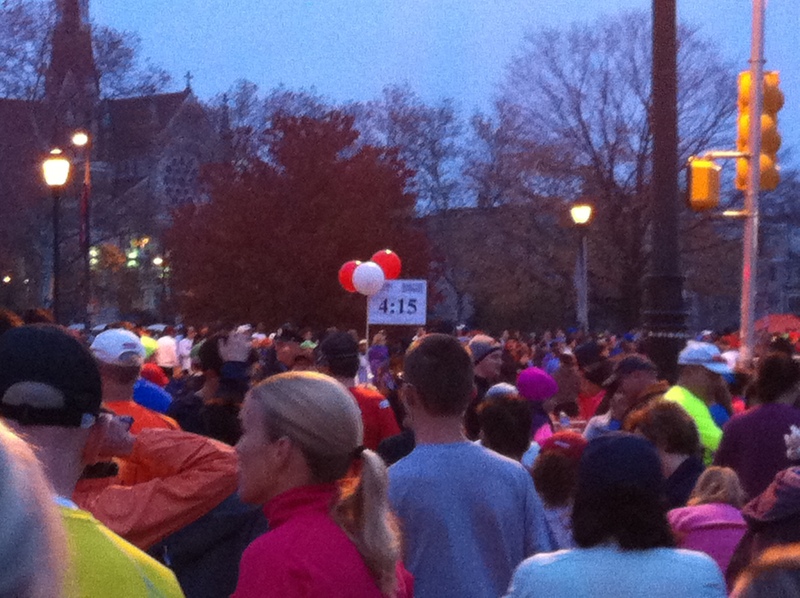 I was excited to maybe watch part of the NYC marathon Sunday morning before I’d have to get to the airport. 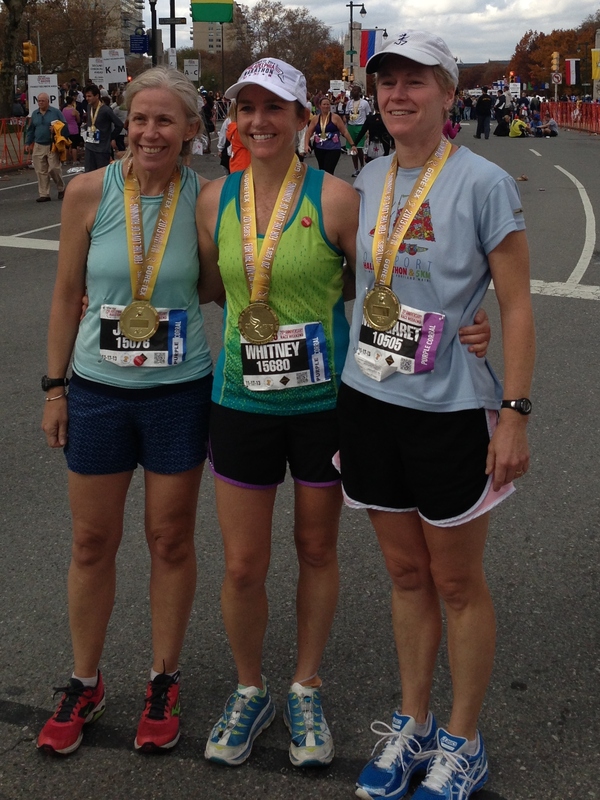 I have three friends running the NYC marathon and it would have been fun to get a glimpse and let out a loud “YOU GO!” for good cheering. Then it occurred to me that if the marathon was underway, there was NO way I’d be able to get out of the city and make my flight. So, sadly, I switched to a 10:45 pm flight out of New York on Sat evening. BUT – as I was sitting in the airport catching up on Breaking Bad (thanks, Neflix!) – I saw Seth – The Guy- from my local running store, Maine Running Company. Seth has counseled me on shoes, gear, socks, and most recently, on water amounts and Power Gel to kick my cramps. He’s an elite marathoner. He’s also a professional rep for Mizuno, so he had been in NYC working at the Expo. I said hello and it took him a second to recognize me out of the context of my whiney visits to his store, but then he smiled and sat down next to me. I like Seth, but really, the best part of our chance meeting and shared waiting time is that he has run the Philly Marathon (more than once, I think) and had lots of good information. 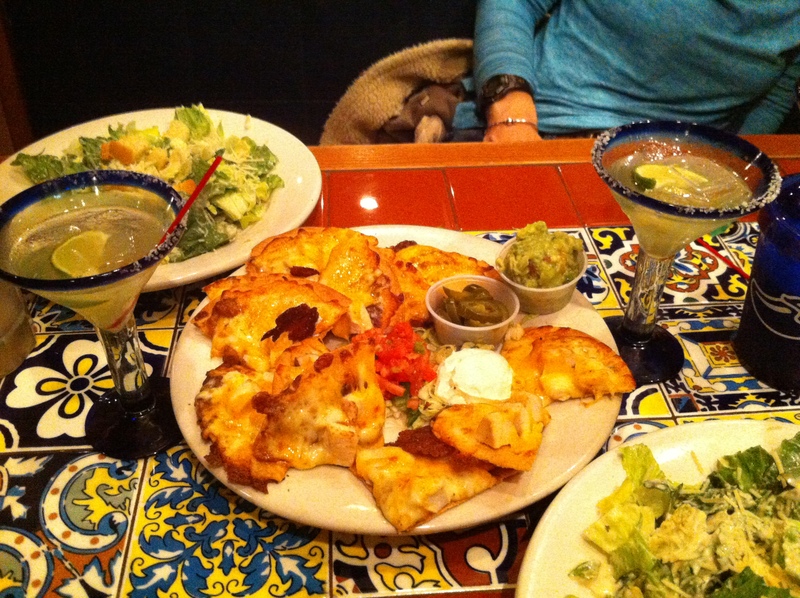 This is *exactly* what I’ve been craving. I need details. Where’s a good place for my daughter to cheer? How will I get the food that I want to eat in advance when I don’t have a car or a place to cook and I don’t want fancy, saucy, restaurant food? Where are the hills? How dark is the start? Etc. I like to prepare. It’s my personality. I can hold a lot of details in my head and knit together a good problem solving plan. 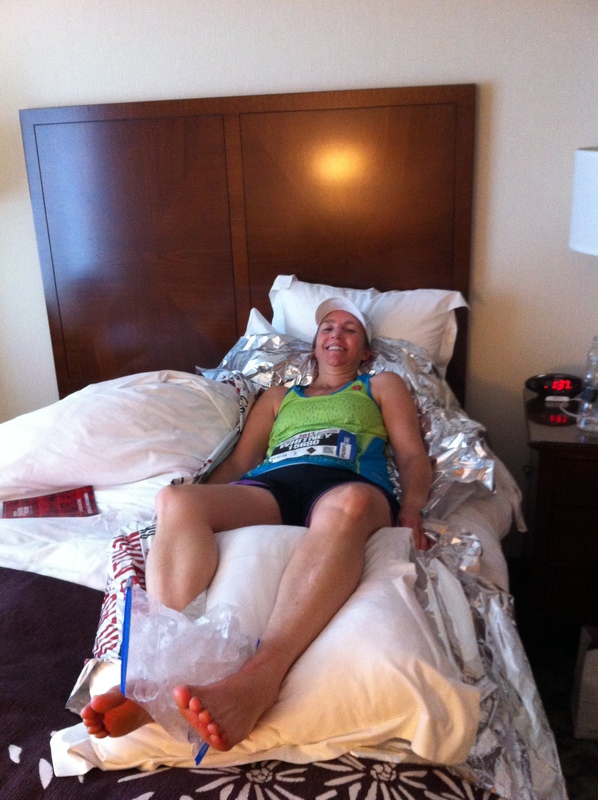 I have been woefully short on Philadelphia Marathon details. The website hasn’t changed in months. No email updates. No tasty nuggets of new info. Basically, I know it’s 26.2 miles and my hotel is 1 mile away from the start, the race will provide water, Gatorade and Clif Gel. According to my training plan, I am officially “tapering” for two weeks. This means that my last really long run was the 20 miler last weekend. Mid week runs were 3-4 miles with 12 miles as the long run this weekend. You might think that after 20, 18, 15, 18, 20 milers that 12 would be a breeze. Nope. Twelve miles is still 12 miles. It’s a long way. But, as I look ahead to the weekdays my runs are only 3 miles each. That is pretty breezy compared to the long stuff, so I’m pretty happy about that. Since I won’t be torching 600-2000 calories every time I lace up now, I need to really think about my food intake over the next couple of weeks to be sure that is efficient, healthy, and in line my caloric storage needs without overdoing it. 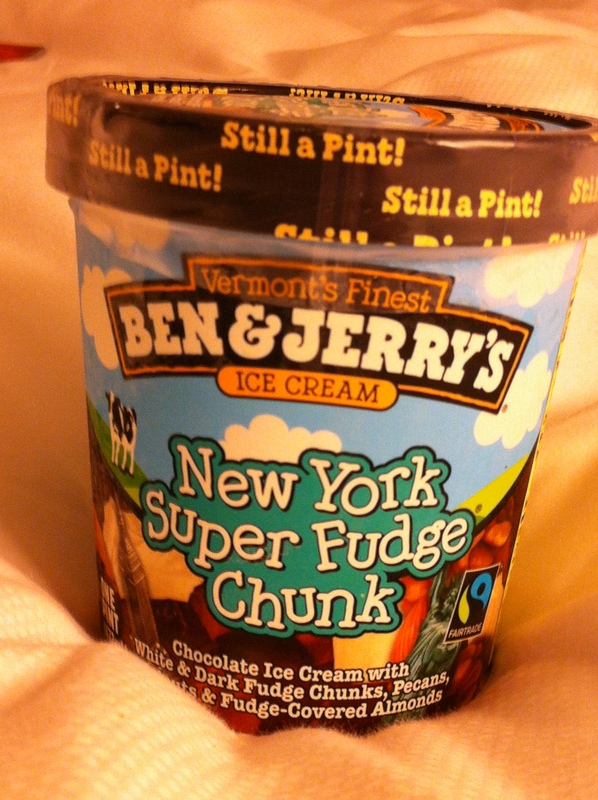 In other words, I can’t have the whole pint of Ben&Jerry’s New York Super Fudge Chunk for dessert. At least not all in one sitting. Discipline. Breaking Bad is the only binging allowed between now and race day. Plus, the other good thing about this meal is that, because it’s chili, I’m not likely to overdo it with 2nds and 3rds. 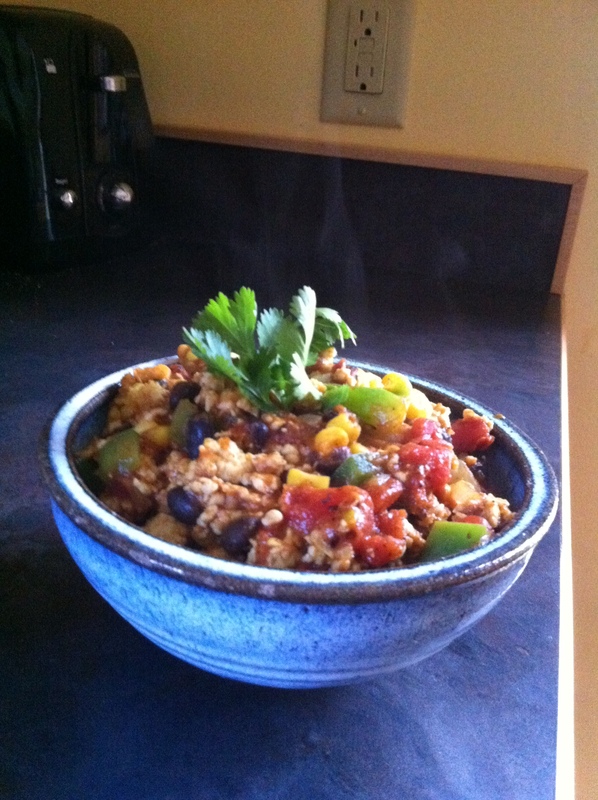 A chili meal is a one serving meal – always. 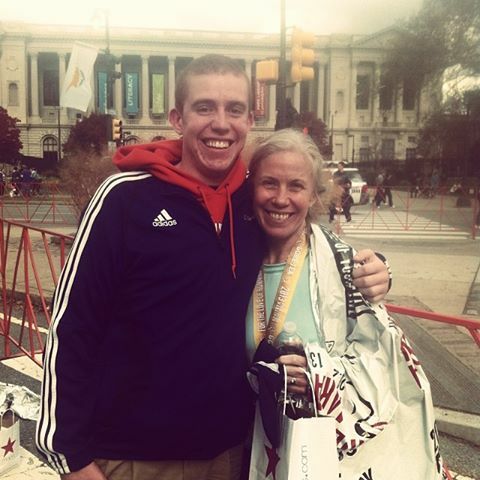 The combo of the NYC marathon and tapering makes me want to just get to Philly already. The challenge will be to divert the energy I’ve been leaving on the pavement to other productive things in the meantime. Chances are, my house will be REALLY clean.